Begin by making a wire loop on one end of the sterling silver wire. String on one of the seed beads. Right after the seed bead make an second wire loop. Before closing the wire string on one of the ceramic charms. Close the wire loop and trim the excess wire. Open the loop on the ear wire and slide it onto the first wire loop you made. Close the loop. 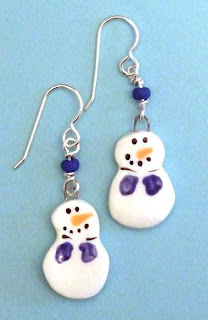 Follow steps 1-3 again to make the second holiday earring.